I have been skiing since I was 9 years old with my first experience in Vermont America. As soon as I stepped onto the snow I fell in love with it! Even as a child I appreciated the beautiful winter wonderland surroundings with icicle rimed houses and snow covered trees; but it was ultimately the sensation of gliding along the snow reaching (in the eyes of a 9 year old) great speeds! However, it is also ranked the seventh coldest state in America with the average temperature ranging from -12 to -16 between December to February…this part of the skiing I did not enjoy…despite my parents effort to ease my cold hands with what I can only describe as ‘tea bag’ hand warmers. Despite my ongoing battle with the cold, in 2009 I decided to experience a whole ski season in Whistler Canada where I became a ski instructor. I had an incredible experience and adored working on the mountain with a ski slope as my office. Although, as expected the cold was an issue especially when I had to remove my gloves to help students with their equipment! I powered through the season due to my love for skiing and instructing and continued to ski more exciting locations. However, a trip to France in February 2013 was the last straw! My hands were suffering so much from the cold that I resorted to taking regular breaks indoors (not my idea of fun when I am there to enjoy the slopes)! On my return to the UK I set myself the mission to find the perfect gloves which would save me from Mr Frost. After visiting shops, looking through catalogs and exploring the internet I stumbled across Blazewear. I was amazed to see they had two glove products ‘X1 – Heated Liners‘ and ‘Powermax Sports Gloves‘ which both involve ‘heat technology’. 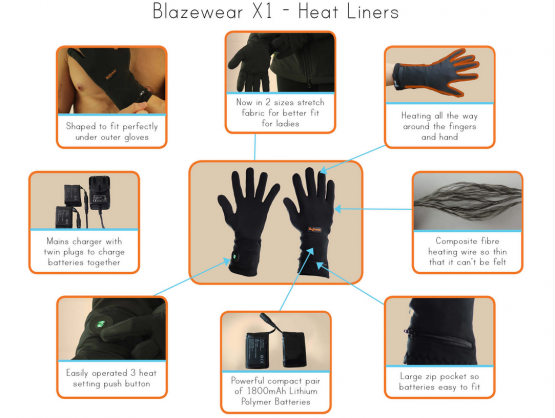 After some product research and reading a fantastic review by The Independent, I decided to try the ‘Heat Liners’ with further recommendation from the Blazewear staff. When the product arrived on my desk I was overwhelmed with excitement and at first glance and touch was highly impressed with the design. The gloves looked smart and fitted perfectly, but on closer inspection I noticed something odd…I could feel no hidden wires. In my head I could not comprehend how these gloves could possibly heat my hands. To trail these products I headed back to Canada in December 2013 where I struggled so often on the long chairlifts and ski trails. To reserve battery I resisted the temptation to turn them on straight away and waited until the cold started to reach my hands (this obviously not taking long!). With great anticipation (and if I’m truly honest slight scepticism) I pressed the button and waited for the miracle to happen…to my amazement in a few short moments I felt the heat sensation travel up my hands and into my fingers…I turned to my family on the chair lift with a huge grin on my face and virtually screamed ‘It’s a miracle!’. My family were in slight disbelief by the time we got back to the hotel that I had not complained all day (also with a hint of scepticism as to how the gloves work). I insisted they all must put the glove on and feel heat (like me) they were equally stunned. On a technical note, I should mention that I was hugely impressed with the two heat options meaning I could adapt the heat when necessary and the battery life. 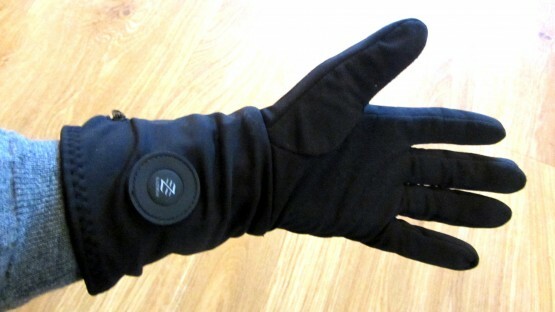 I found that by preserving the battery, by only turning them on when necessary and often using the low heat option, I was able to use the gloves for 3 days before they needed charging. In summary, I highly recommend these gloves. They look stylish, fit perfectly, feel soft against the skin, feel comfortable under ski gloves and most importantly they work! I am delighted to inform that my battle with cold hands is now over thanks to this incredible product. My only regret is that I have not owned these gloves sooner, but I look forward to wearing them again in February on my trip to France. To find out more about Blazewear and view more products please visit their website.